Douglas Crockford. will be speaking. Starts at 9:00 AM. We're excited to announce FullStack2gether, to be held on Saturday 14th July at Skills Matter's home, CodeNode. #FullStack2gether is organised by Skills Matter and the Community. Together, we will host a one-day-long event with workshops and challenges. 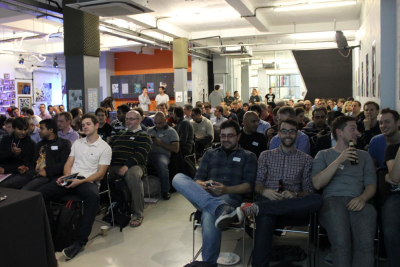 We're excited to announce FullStack2gether, to be held on Saturday 15th at Skills Matter's home, CodeNode. #FullStack2gether is organized by Skills Matter and the Community. Together, we will host a day-long event with a few workshops and challenges.